« Are Textbooks Science Fiction? Last Friday, several hundred people from a wide cross-section of the sciences and humanities converged on Orlando, Florida, to participate in the DARPA-sponsored 100-Year Starship symposium. As the name tells, this was a preliminary gathering to discuss the challenges facing a long-generation starship, from propulsion systems to adapting to extraterrestrial homes. I was one of the invited speakers. I won’t have the leeway of long decompression, as I must immediately submerge for a grant. However, I think it’s important to say a few words about the experience and purpose of that gathering. Given the current paralysis of NASA, activities like this are sorely needed to keep even a tiny momentum forward on the technologies and mindsets that will make it possible to launch long-term crewed ships. Open to the public, the event lasted two and a half days, the half being summations. Content-wise, half was about the usual preoccupations: propulsion systems, starship technologies, habitats. The other half covered equally important but usually neglected domains: biology, society, ethics, communicating the vision. The talks were brief – we were each given 20 minutes total – and varied from the very broad to the very specific. The presentations that I attended were overall high quality (though I personally thought “exotic science” should have been folded into the SF panels); so were the questions and discussions that followed them. The age distribution was encouraging and there were many women in the audience, of which more anon. Some aspects of the symposium did dismay me. Structurally, the six or seven simultaneous tracks (with their inevitable time slippages) not only made it hard to go to specific talks but also pretty much ensured that the engineers would go to the propulsion talks, whereas the historians would attend those about ethics. The diversity quotient was low, to put it mildly: a sea of pale faces, almost all Anglophones. Most tracks listed heavily to the XY side. This was particularly egregious in the two SF author panels, which sported a single woman among nine men – none with a biological background but heavy on physicists and AI gurus. It was also odd to see long biosketches of the SF authors but none of the presenters in the official brochure. Most disquieting, I sensed that there is still no firm sense of limits and limitations. This persistence of triumphalism may doom the effort: if we launch starships, whether of exploration or settlement, they won’t be conquerors; they will be worse off than the Polynesians on their catamarans, the losses will be heavy and their state at planetfall won’t resemble anything depicted in Hollywood SF. Joanna Russ showed this well in We Who Are About To… So did Chelsea Quinn Yarbro in Dead in Irons. But neither story got the fame it deserves. On the personal side, I had the pleasure of seeing old friends and finally seeing in the flesh friends whom I had only met virtually. I was gratified to have the room overflow during my talk. My greatest shock of happiness was to have Jill Tarter, the legend of SETI, the inspiration for Ellie Arroway in Contact, not only attend my talk but also ask me a question afterwards. “If we seek our future among the stars, we must change for the journey – and for the destination. Until now, we have participated in our evolution and that of our ecosphere opportunistically, leaving outcomes to chance, whim or short-term expedience. In our venture outwards, we’ll have to overcome taboos and self-manage this evolution, as we seek to adapt to the new, alien worlds which our descendants will inhabit. This entry was posted on Monday, October 3rd, 2011 at 7:36 pm	and is filed under Biology & Culture, Science, Space Exploration. You can follow any responses to this entry through the RSS 2.0 feed. Both comments and pings are currently closed. I, too, was frustrated that I could not attend sessions outside my discipline. I had the responsibility of presenting in my disciplines. I already know about that. I want to learn about things beyond my discipline. I am curious as to Athena’s impression of the closing ‘communicating the vision’ panel. Might Hollywood, in their attempt to share the excitement, continue to miss the really provocative issues as they rerun old plots in new settings? It sounds like it went better, or at least not worse, than you expected, as you had already anticipated many if not most of the downsides. And that is cool to have Jill Tarter attend your talk (and ask a question)! Good luck with the grant. What would the discovery of an alien civilization mean for the most basic tenets of Christianity? This question was explored last Saturday at the 100 Year Starship Symposium in Orlando, Florida. At this DARPA-sponsored event, theologian Christian Weidemann of Ruhr-University Bochum attempted to square the messianic salvation of mankind with an endless galaxy rife with (if I had my druthers) laser-griffins and sentient mop empires. In a panel titled “Did Jesus die for Klingons too?”, Weidemann recognized the conundrums of trying to balance Jesus Christ’s salvation of mankind with a massive universe of billions of galaxies. FYI: The Klingon equivalent of Jesus, more or less, is Kahless the Unforgettable. These are good points, and I think it’s also worth pondering that science fiction has taken its time looking at such issues, although I do note recent novels like Greg Bear’s Hull Zero Three that start to get at the real problems of interstellar migration. Geoff Landis has also done some short fiction in this regard that speaks to the point you’re making. Again, elegant comments all around, a sound analysis indeed. I suspect Christianity wouldn’t be able to survive contact with a Kardashev II civilization that is completely secular but any extraterrestrials less advanced than that they’d probably just try and convert. Probably adopting the other species’ gods as saints like Roman Catholicism did. Of course, Mormon theology allows for life on other planets, with their own saviors. I’m interested that there were panels on ethics. What ethical issues come up when talking about generational space flight? Is it questions about governance? Agree with you about the hope for sustained follow-up, and the evolutionary divergence of our descendants, while disagreeing with almost everything else. Good to hear your impressions of the symposium, thank you for those. Wish I could have been there! Marc, I was not able to attend the wrap-up sessions and Hollywood’s past record is highly dubious, to put it mildly. In the days of yore, they used to consult SF authors, at least. Not any more — now it’s strictly script doctors who are experts of… Hollywood conventions. Calvin, not only is Tarter a bright light, she’s also very nice (two attributes very often uncoupled in the famous). Larry, Paul2, I really don’t think any monotheistic religion can be reconciled with ETIs, no matter how much handwavium you add to the balance. Paul1, thank you for both the wonderful words and the signal boost. Your own analysis was eloquent and insightful. Francesca, ethics are (have to be) woven throughout this discussion: from the dilemma of native life in prospective planetary homes to governance of the journey and planetfall. Stephen, what do you disagree with? The scarcity of women and non-whites? Status at planetfall? Need for changed mindsets? As you can tell from comments here and elsewhere, these are not in dispute except for people who continue to envision this as a Hollywood movie. Though I’m a big fan of Chelsea Quinn Yarbro, I have to disagree that the status at planetfall (assuming, and a big assumption, that interstellar travelers will want to have anything to do with big gravity wells) will not be a good one. The rate of attrition is likely to be so high, as you suggest, and at least initially, that the odds of surviving BADLY are probably pretty small. Spaceflight is one of those things that it’s really hard to do badly, at least for very long or more than once. Have you ever read how people fared in long sea voyages or treks over deserts, frozen wastes — hell, even over the Rockies? Starvation, scurvy, food poisoning, dehydration, tetanus, gangrene, cholera, madness, mutinies, storms, avalanches… entire contingents were lost, and this was Earth. Even today’s nuclear subs are horrific places. The rest of our vehicles, from cruise ships to the Space Station, are blatantly non-self-sufficient and their consumption footprint is enormous. We may be prepared for every eventuality we can think of — but I guarantee you there will be plenty we haven’t thought of. I am also thinking, sometimes, that capitalism itself as we know it today, could only be sustained indefinitely (in terms of perpetual growth) only through colonization; our planet cannot sustain it with its finite resources. This human tendency of spreading and consuming seems very, well, viral? Do let us know when the rest is published. I agree on all counts, Eleni. Hence my worry over the triumphalism that still runs through these discussions. From an outsider’s view, humans are like locusts or army ants (or, worse yet, lemmings). We have done badly by our planet as well, and at this point it looks irreversible. 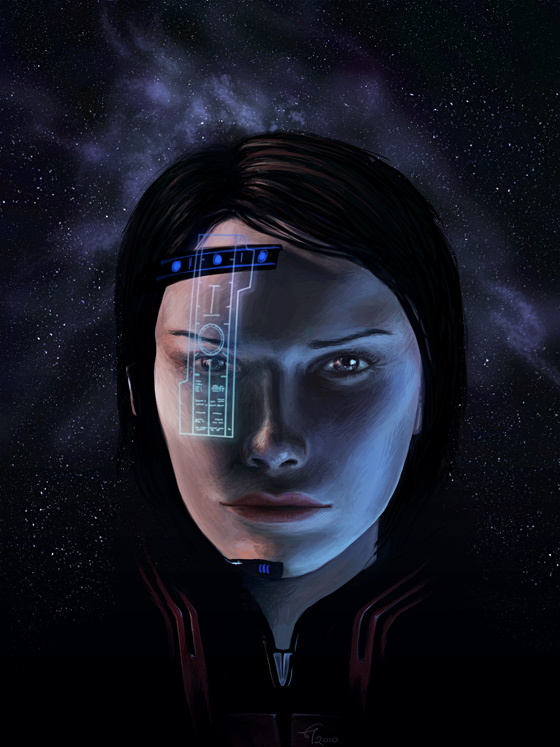 Perhaps the person in Spaceborn is really a highly advanced being who chooses to look like a human woman with a few fancy technogadgets attached because that is what she wishes and can choose to look like. The residents do this all the time in the Orion’s Arm universe. As for religion, it may be one of the strongest and earliest driving forces that get the first humans into the wider galaxy. I can also see it keeping a worldship society intact and functioning, whether people agree with religion or not. Just basing this idea on history. Choosing appearance is a neat and beguiling idea, Larry, though totally unlikely in the near-future (at least our near future). I must regretfully agree with you about religion, although it’s not the sole motivator for such expeditions — and we’d do well to leave it behind, if we can. The desires for glory, fame and profit have fueled many such launches; so has the thirst for knowledge, though I suspect/fear that will be low on the hierarchy rungs of long-generation starships (not true for exploration expeditions, of course). Athena, I certainly disagree with you re status at planetfall. I don’t see why the starfarers would be badly off. I think the difference must be that you are assuming a vehicle for which rather little heritage exists. I am assuming a vehicle based on some centuries of experience with large-scale planetary and space colonisation and long-distance transport around the Solar System. You assume quite a lot, Stephen, and we’ve already been through some of those assumptions in earlier discussions. As I said earlier to Coolstar, what I describe happened repeatedly on Earth with plenty of “heritage” and much better prior knowledge than what we will have when we launch the first generation of starships. Even if all your assumptions are met, the long-generation launches will almost certainly be one-way and one-shot per destination. I guarantee you we will not have thought of every potential problem for either the journeys or the planetfalls. Elegant as always. Watching you think in your writings on these issues is like enjoying a fine dance performance. I have a concern to add to the mix, about species readiness for our ventures across the void. I hope we don’t do the star-faring thing as a “cure” to the Malthusian trap, but I dread that we might. If we develop “breakthrough technology” too soon, then there are awful pressures that might send out the first generations of star-farers as a “Life Burst” of technological locusts. The glib speculations of the hard AI crowd, who blithely think that turning solar systems into computronium is both feasible and desireable… I can only shudder. Thank you for the lovely words, Adam! I couldn’t agree with you more. This is why we must do this — and similar ventures — thoughtfully and carefully, for everyone’s sake (including ours). Athena, please excuse me for coming back to you on this. I trust that it will be of interest to both of us (well, certainly to me) to pinpoint where the divergence in our views lies? I assume quite a lot. What do I assume? Take power, materials, and society. The spectrum of each star is already very well known, so the performance of solar arrays near that star to provide an incoming expedition with power can be predicted with confidence. Material resources: I am assuming that asteroids contain much the same mixture of volatiles, rocks and metals everywhere, with availability broadly correlated to the metallicity of the star (which can be measured telescopically). But clearly this can be established more exactly by a robotic interstellar probe before the worldship departs for that system. Society: I am not *assuming* that society on a worldship will be stable, or its population, agriculture, biology, microbiology, genetics etc under control, or its construction from asteroidal raw materials possible. Rather I am trying to point out that these factors in the operation of the worldship need to have become standard practice for a number of centuries in the Solar System as a *logical precursor* to launching a worldship based on that type of society. If the interstellar journey lasts say 1500 years, then I am arguing that space colonies in the Solar System will need to have been operated for at least that period of time prior to the journey, in increasingly isolated regions, before the starship can launch safely. Further, this is a question of general economic and population growth, not a government research programme. Clearly this affects one’s concept of the roadmap towards human interstellar travel. I’ve just ordered a copy of the novel by Joanna Russ which you recommended. It appears to be set on an Earth-like planet, so may not really be relevant to the concept of progress outlined above (in which Earth-like planets are not occupied by the immigrants), but I shall enjoy reading it in any case! And I do very much like the image of Spaceborn, above. Too many space artists focus exclusively on pretty planets, rockets and alien landscapes — inspiring in their way, but missing the human element. The best artists can convey their message through the human face. I won’t discuss this further, Stephen, since I have already done so extensively. The Russ novel is a difficult read, so be prepared! Someone asked about ethics. I gave a talk at 100YSS on “ethical economics. It is really just Schumacher’s “Buddhist Economics,” with the religion removed. Standard economics gives a limited picture of the value of space travel. Standard economic man is selfish for technical reasons, albeit not a bad model of standard humans. However, some part of us is better than that; some part of us cares about the future of the human race. Also, for technical economic reasons, the standard time value of money math doesn’t exactly apply to starships. As to the problems of settling other worlds, my brother wrote a series of parables about that. See Robert J. Blodgett, Greening of a Planet. I’ve been enjoying your blog. And I know almost no Latin. I was curious to read it in context. Wikipedia has the references, but then I went back to Project Gutenberg’s edition of the Aeneid. I couldn’t find “to the stars” in that edition, unfortunately. I hope this can be cleared up. Below is a pedestrian, but at least accurate, translation. The implication is that the victor will become immortal. Too bad the Gutenberg version wasn’t any good. I didn’t know which site to trust for the best translation. ORLANDO, Fla. — A starship without an engine? Yet here in Orlando, not far from the launching site of the space program’s most triumphant achievements, the government’s Defense Advanced Research Projects Agency, or Darpa, drew hundreds this month to a symposium on the 100-Year Starship Study, which is devoted to ideas for visiting the stars. It was Dr. Breeden who offered the idea of an engineless starship. “Vision without execution is daydreaming,” Mr. Neyland said in his introductory remarks, paraphrasing a Japanese proverb. For Dr. Breeden, discussions with other attendees affirmed his underlying idea and calculations, but it seems unlikely that asteroid flinging would be sufficient by itself. Still, it could prove a useful and cost-effective supplement for other propulsions systems. The $1.1 million study — $1 million from Darpa, $100,000 from NASA — will culminate with the awarding of a $500,000 grant to an organization that will take the torch for further work. Darpa would then exit the starship business, sidestepping interrogation by Congress during the next budget hearings of why it was spending taxpayer money on science fiction dreams. Perhaps tellingly, no high-level NASA officials spoke at the symposium other than Pete Worden, director of the Ames Research Center in California, whom Mr. Neyland described as a “co-conspirator” and who is often regarded as a maverick in the space agency. “If we’re lucky, it will change NASA,” the science-fiction-writing Dr. Benford said of the starship research. Some speakers said they thought the first goal over the next century should be colonizing the solar system, starting with Mars. The DARPA grant is bizarre — a single one-time fund, with a budget that would buy one Pentagon toilet. This encourages rank amateurism; I, for one, don’t really expect to see a functioning starship emerge from the deliberations of this symposium. Couplets are cute, but they’re not rockets. If Obousy and Zubrin were in a debate (or a closed room), I’d put my bets on the latter. Why don’t we just build space habitat rather than generation ships? You have the same living space problems but avoid the propulsion and ‘what do we do when we get there’ issues. If you’re not building a moving ship you can engineer the structure itself to help with issues of interior space, artificial gravity, and other items that in a cigar become problematic. Parked in a nice stable L1 orbit you could also conceivably send a rescue mission if something went wrong, another risk you avoid by just making more living space in space rather than sending people away. You could then also build the space elevators, start constructing ringworld, and other useful items, again, without losing $$ of production by sending it away. The two overlap in many ways. However, space habitats will require constant energy inputs of all kinds for as long as they exist. Ships will have destinations. Planetary existence on terrestrial planets, despite some drawbacks, makes it possible to live in a system that passes for closed (as long as those who live in it don’t exhaust its resources, as we’re close to doing on earth). Wallowamichael and Athena: I find it helpful to think of artificial free-orbiting space colonies and the habitat sections of interstellar worldships as being basically the same type of construction. If a series of space colonies is constructed at increasing distances from Earth and in increasingly more remote regions of the Solar System, then the living quarters of a worldship can be regarded as the logical endpoint of that evolution. Clearly, a multi-generational worldship is, from the point of view of the large majority of its occupants, a space colony that happens to be located in interstellar space, not a vehicle with a destination at all. It will need an autonomous source of power such as nuclear fusion or an antimatter reactor, though the quantity of energy required to sustain itself is, on all but the very slowest of interstellar journeys, very small in comparison with the propulsive energy required. Am currently reading your To Seek Out New Life, and enjoying it immensely! Indeed, they are a continuum along several dimensions. When Drake, Tarter, Shostak and Werthimer go, who will take their place? That’s another burning question.